Sometimes a girl just needs a doughnut. It’s not fair, really. Because, in life, if I see a doughnut, I need to have one. It doesn’t matter what time it is or exactly how much caramel is involved or how hard my thighs try to tell me to resist – the craving has set. Don’t get me wrong, I don’t go into any sort of face-shoving-doughnut frenzy — I’m a lady, you guys. Most of the time. But once my brain has doughnuts inside it, you’d better believe there will be a doughnut in the near future of my face. And if glaze or sprinkles are involved? Well then I’m pretty much done for. There are a number of sources which have fueled my doughnut-brain of late: the newest issue of Saveur (which I haven’t even read yet but HOLY DOUGHNUTS), the bomboloni lady at the Ferry Building (why are you and your pastries so cute and covered with sugar? ), and Shutterbean Tracy (girl, what are you doing to me??). So you see, it can’t be helped. Doughnuts must be had. Baked, dipped, had. I felt emboldened by my purchase of coconut flour at Whole Foods a few months back, but also kind of intimidated about actually using it. So there it sat, in the back of my pantry, for entirely too long. When my doughnut-brain demanded a baked coconut doughnut, I figured I’d put on my big girl pants and give the flour a try. Turns out it’s pretty great. 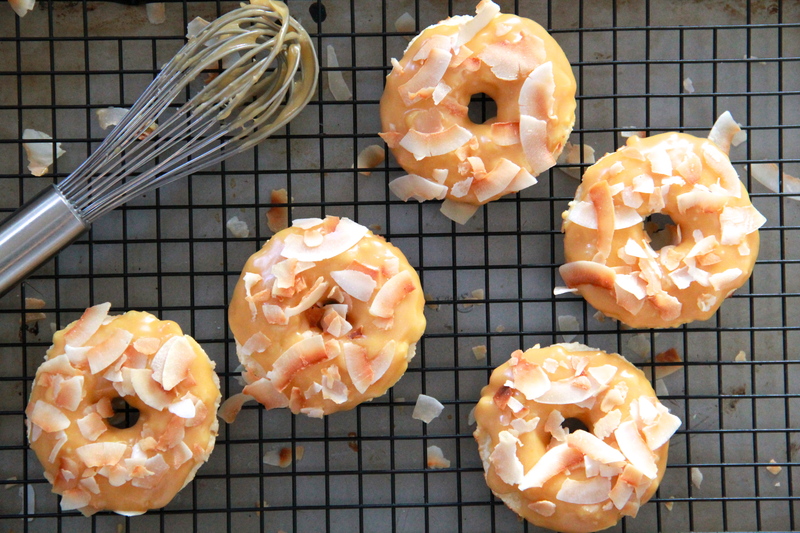 Coconut flour is extremely absorbant so requires extra liquid in a recipe — if you don’t have or want to use coconut flour for these doughnuts, you can absolutely substitute cake flour, but dial back the buttermilk to 1/4 cup plus 2 tablespoons (if the batter looks way too dry, you can always add more by the tablespoon). Heat the oven to 425. Spray doughnut pan lightly with cooking spray. Spread coconut flakes onto a clean baking sheet, and toast the flakes in the oven until golden, about 5 minutes (keep an eye on them, they’ll burn quickly! In general, I find that as soon as you can really smell them, they’re ready to come out of the oven). Allow toasted coconut flakes to cool. In a large bowl, whisk together the AP flour, coconut flour, sugar, baking powder and salt. Add the egg, buttermilk, and coconut oil all at once, and whisk well to combine. I switched from a whisk to a spoon halfway through mixing, because the batter kept getting stuck in my whisk. Annoying. Divide the batter between doughnut cups, filling each almost to the top. 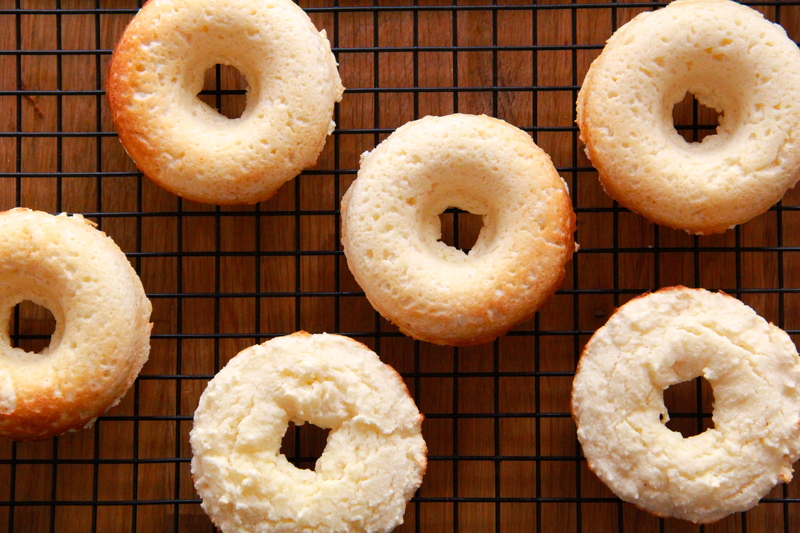 Bake doughnuts 8-10 minutes, until they spring back when gently nudged with a finger. Allow doughnuts to cool in the pan for 3-5 minutes before dipping in caramel glaze. While the doughnuts are still baking, combine the sugar, molasses, butter, cream and salt in a small saucepan. Place pan over medium heat and bring to a boil, stirring constantly (the butter chunks will melt along the way). Once caramel has reached a rolling boil, allow it to boil for exactly two minutes, still stirring, and then pull it from the heat. Let caramel cool in the pan for a minute before whisking in the confectioner’s sugar. Once caramel glaze is ready, dip the slightly cooled doughnuts in the caramel, coating the tops of each. Working quickly (before the glaze has time to set up), sprinkle toasted coconut on top of the caramel layer. 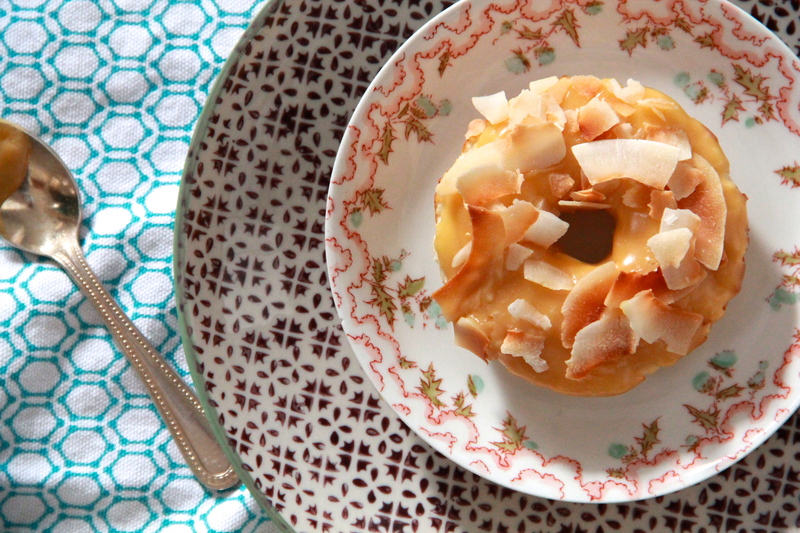 Savor the still warm doughnuts, or eat them at room temperature. Doughnuts are best enjoyed the day they’re made. These look truly perfect. I feel sick from a too sweet hot chocolate, and I still want to eat one of these. 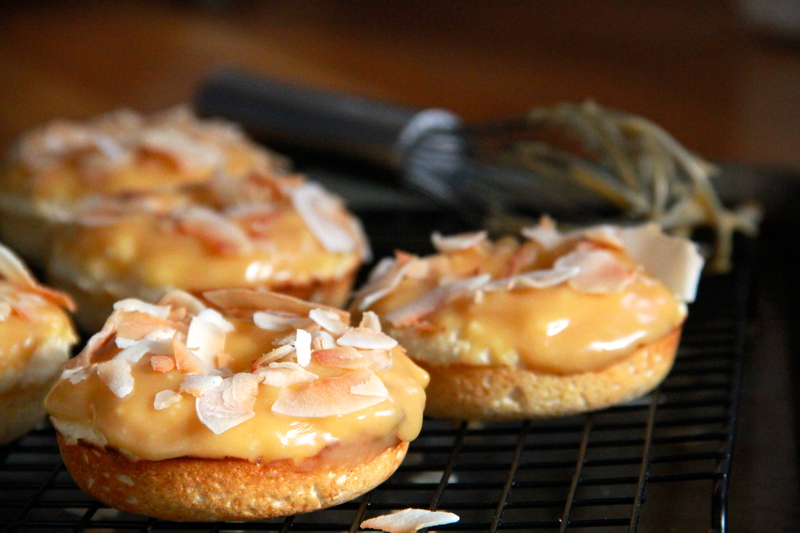 Coconut and caramel is a dreamy combination. Add it to a donut? Ugggghhh. Too good. Thanks, Sarah! And everyone knows the antidote to saccharine hot chocolate is doughnuts… probably. I’ve had severe coconut cravings lately. I think the dreary, cold, windy weather here brought it on. I ordered red curry with coconut milk last time we ate out, bought coconut oil at Trader Joe’s, and keep sneaking pinches of shredded coconut from the baking cabinet. 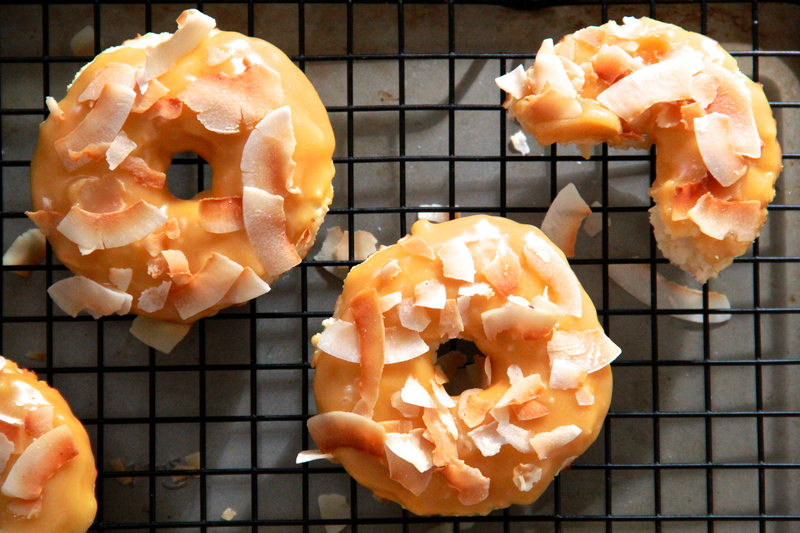 And now…magical coconut doughnuts…please just let there be sun and beach vacations already. i want donuts and i want them now. thanks. I am dying to make donuts again! I have the pans. Weekend project here I come 🙂 Although I feel like cinnamon sugar is a must! cinnamon sugar is never a bad call. maybe even cinnamon coconut sugar?!? I think that sounds positively lovely.